First up: my daughter is banned from my blog until after Christmas, so Jessica, if you're reading this, close your browser! With just over a week left until Christmas I've got some serious knitting to do. I'm a little further behind than I'd like to be right now. I thought I'd knit more when I was in Kingston but time has a way of slipping by. Maybe now that I'm home I can pick up speed. 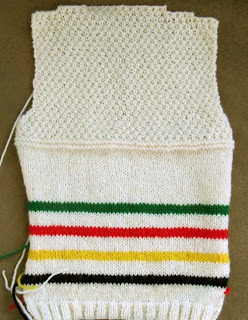 I'm working on a stealth/Christmas sweater for my Grandson. I posted the colors in my last blog entry. If you're familiar with the Hudson's Bay Company then you'll be familiar with the colors. You can see them behind their logo. The company is a Canadian institution and has been around since 1670. The stripes are instantly recognizable on blankets and heavy sweaters. I decided to make Braydon a cardigan with a shawl collar in the HBC style, size 2-3. I found this Sirdar pattern on Patternfish to use as a template. This little sweater is cute and very masculine, in my opinion. 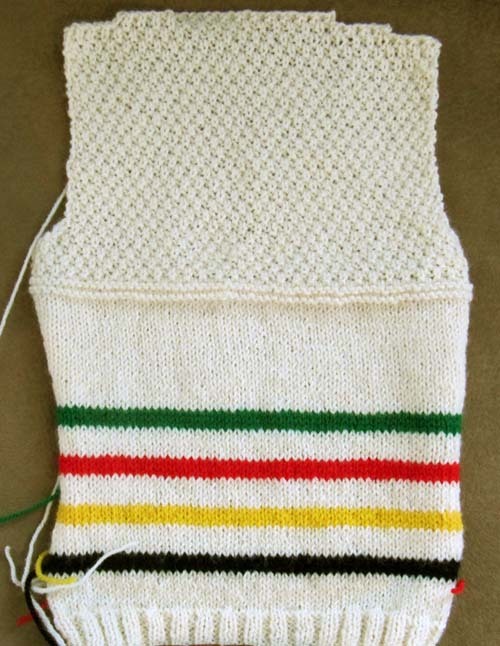 I've knitted the back of the sweater using the striped design. I have the rest of the sweater to finish, so I'm off to knit. Time is short and I still have another gift to make after this one. oh, those Hudson Bay colors make me homesick -- can't wait until next week when we'll be heading up to Ontario. I think I might prefer the sweater in stockinette too but he seed stitch is nice and hard to think of having to frog it all at this point. Good luck with your deadline!